V.I. Buys – more foot-based fancies! I thought it about time I shared some more lovely repro shoes with you all. We had these copied from a late 1940’s/early 50’s American pair of sandals, and we chose this design as it’s so typical of a casual wedge sandal from this era, and also for their dance ability – wear ability – and comfort. You’re going to love them! They can be worn just as easily on the pavement as the dance floor – no having to change shoes because the shoes you like to dance in can’t handle outside wear! However, I did read the dreaded words, “THE SIZES ARE SMALL SO YOU MAY NEED TO ORDER A SIZE LARGER THAN YOU WOULD USUALLY TAKE.”at the bottom – say it isn’t so! Being a size 8, there’s never usually anything larger. I hope to go and try them on in person at an event soon, so as to save Kaye (and myself) the trouble of returning them if they are too small. 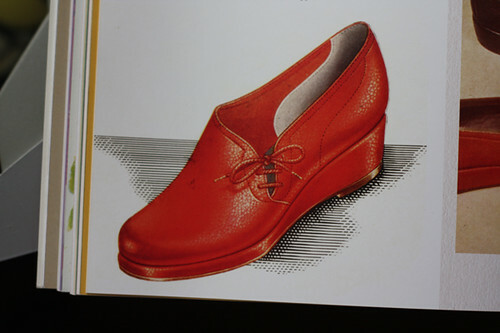 My next confection is a lovely design from Clarks. They often reissue shoe designs from their archives, and these are from their 50s era. But I think they could pass very well for WWII era utility wedges! It’s actually on the cover, as I just realised whilst looking it up on Amazon for the link! It’s a fab book, by the way, so if you haven’t got it, go and buy it now! Talking of projects, I have now had a wonderful response to my ticket giveaway – stay tuned because I’ll be picking the winner out of a (vintage) hat tonight at midnight (well, bedtime, whichever is earlier) and announcing the lucky blighter then. Still a few hours left to enter! PS. UK readers can see me in the Telegraph newspaper today, accompanying an article about retro-socialising. Well, part of me, peeking out behind a vintage dress being held up by the amazing 60s burlesque super-spy Agent Lynch! The picture was at the Vintage Secret boudoir, and the whole article is worth a read, featuring VS, as well as my chums at the New Sheridan Club, the Chap, and more. I LOVE Rocket Originals shoes they are simply the best, you can't beat their quality! What about Rocket's new handbags on their home page! I may regret that whole not having a job thing! oh i saw the rockets yesterday and started drooling a bit 😀 too bad it's september soon and a bit cold. i loooove the clarks! i've been wanting something similar for a while now but never found anything that looked nice. so thank you for sharing! hopefully i'll find them in sweden. i wanna go to london, you've got the best shoestores! Hello, I'm an avid lurker of your blog and I love your vintage style! I see that you wear a snood a lot and would love to wear one too, but would like some help in the best way to fasten it to your hair. Could you do a tutorial? You wear one so well, I would love to know how you do it! i saw those rocket shoes yesterday and i thought, hmm, Inky, you have no beige shoe…..and the pleasure of living in Central California is I can wear them just about year round. they've been moved to the top of the covet list. i hear they are nicer than Remix! I blogged about those Clarks shoes as well, I really want them! have had 5 pairs to date!! I live in them!! Always admired! to go with my new frocks of course!! Just wanted to say that it looks like your party will be absolutely fabulous !! Wish I could be there ! Those are swell! I have a pair of Rocket's and I too love them! Will definatley have to have those Judy's in my closet though! They sure do a great job authentically reproducing! Yes! I have that book too! It is a great source of information. Every Vintage Enthusiast should have a copy! Gosh, what lovely shoes! I especially like the ones from Clarks. We used to have Clarks here…don't know what happened to them! those red wedges are soo cute.. love it! i would buy them now! i'm new to your blog.. it's very cool! Aye Caramba ! I love thoses clarks repro ! Arent they wonderful ? Thank you for the tip, ma chere fleur. Oh – now I need both those shoes! Oh the bags are fab! Note how, now I've bought so many of their shoes, they've named a bag after me. (hohoh… not really… just one of the many amusing things that happens when your surname is a noun).